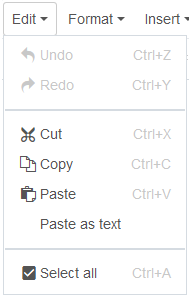 Paste as text - this feature toggles on/off. When toggled on, all styling will be removed from your text when pasted in. If you are bringing in text that you created in another application (like Microsoft Word or other website) the best way to bring that content into Cascade is to use the Paste as text option and then apply any appropriate styling, headings and links. Alternately, you can first paste content into a text editor such as Textpad to remove any formatting, and then copy/paste it into Cascade. 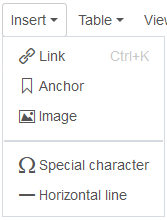 How to insert links and anchors as well as images and media using the editor is addressed separately. Show blocks - toggles on/off. Shows guidelines around your content for elements such as paragraphs, lists and headings. If you are having difficulty with the appearance of your content, this feature can help you see where various formats are being applied and where invisible elements may be a factor. Fullscreen - toggle the editor to full screen. This feature is also available as a button in the editor. 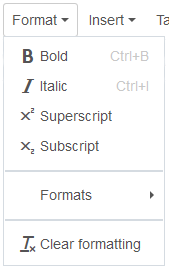 Use the Tab key on your keyboard to indent a list item to become a sub-list item.